As a mom of three boys, I often get the comment, “Wow, 3 boys! You have your hands full.” My response is always the same, “Yes! We have a lot of noise, a lot of dirt, a lot of rowdiness, but a lot of fun.” Let me illustrate this a little better for you… It doesn’t take much for a wrestling match to break out shortly after waking up. They have perfected the one-knee shuffle across the floor as they zoom their cars from here to there, drive their combine and tractors from field to field (a.k.a. rug to rug), and pretend crate their rocks around their construction sites. And dirt, well let’s just say the boys LOVE love dirt! I joke about them being dirt magnets… all they have to do is walk outside and they’re covered. Honestly though, they love to play in the dirt pile, shovel the rocks in our landscaping, and explore the little hill in our backyard overgrown with weeds, groundcover, and trees. So when it comes to buying clothes, I have to take the rough play into consideration. Quality is a major deciding factor when we shop. Quality, affordability, and style. I want my boys to look cute. I want the bright colors to stay bright. I can’t afford to replace ripped out knees and faded colors. So when we shop, I have to be picky and hope that the wardrobe will endure all three of our active boys! I was recently selected by OshKosh B’gosh to review their children’s clothes. 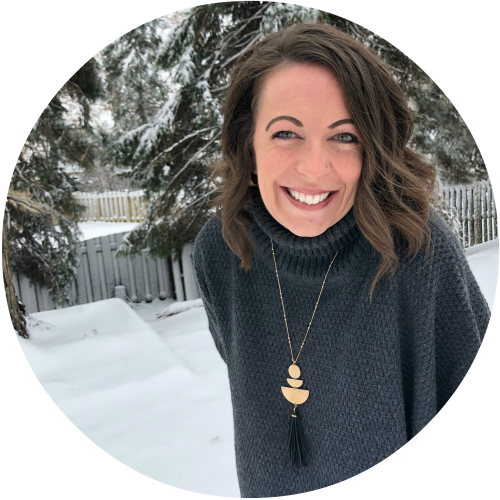 In the interview survey, when they asked if I were an OshKosh B’gosh shopper and what my opinion was of their brand, I had to be honest… I had never shopped OshKosh B’gosh because I thought they were pricey. However, as we shopped there this past week, that perception has changed! Upon entering the store, it was well lit with white walls to help the fun, colorful clothing pop in contrast. The boys were excited! They love to shop and the store was so inviting. They immediately ran up to a display of colored long-sleeve waffle shirts. Their little fingers were pointing, hands were grabbing at the shirt of their choice and Daddy was put to work size searching. The main items we were shopping for were jeans for Connor and Dylan. We tend to have a tough time finding jeans for both of them. For Connor, it is largely because he is so rough on them. It seems the other brands of stylish jeans that fit him well are typically made of a thinner denim. The OshKosh B’gosh jeans, however, have both quality (with a heavier/sturdier quality denim) and a nicely cut style. Likewise, Dylan is so skinny and tall that finding jeans that actually snug up enough around the waist and are long enough to not look like ankle pants are hard to find. While I did have to snug up the elastic in Dylan’s waistband quite a bit, they fit him very well and gave him room to grow both up and out. As the boys explored the store, they were thrilled to see their favorite things (dinosaurs, monster trucks, and motorcycles) adorning the front of the graphic tees. “That one, Mommy! Yah, yah! I like that one!” was a very common cheer that came from both Connor and Dylan as we loaded down Ethan’s stroller with all our exciting finds! And, they had fun finding cool shirts for baby brother Ethan too! After having scoured each rack and display table carefully, we retreated to the changing room. OshKosh B’gosh, we may have to discuss bigger fitting rooms as our family of 5 (plus a stroller) looked like sardines packed in with mounds of clothing. However, we got into a rhythm and soon trying on clothes became as efficient as a production line. Shirt on boy #1, shirt off boy #2, pants on boy #3, and so on! I was pleasantly surprised to see that OshKosh B’gosh clothing seemed to run a little large by a quarter to a half size. We tend to have an awkward “in between” sizes issue… you know the one, where your child is growing out of their current size, but not quite big enough for the next size up. OshKosh B’gosh sizes seem to nicely bridge that gap. Plus, all of the items the boys tried on were nicely constructed and made from a heavier weight material that won’t easily wear out. So… to revisit my interview question of what is my perception of OshKosh B’gosh? Honestly, being that we are bargain shoppers, regular price still made us gulp a little. However, we happened to hit their 50% off sale, used a 25% off coupon, and gained OshKosh B’gosh reward dollars! We came away feeling as though we hit the jackpot! Our total came to $178.54, but our bags were weightier than that! Connor made out with 3 pairs of jeans, a fleece sweatshirt, a holiday t-shirt, and a plaid flannel shirt. Dylan came home with 2 pairs of jeans, a fleece sweatshirt, a hooded OshKosh B’gosh pull-over sweatshirt, a holiday t-shirt, and a plaid flannel shirt. 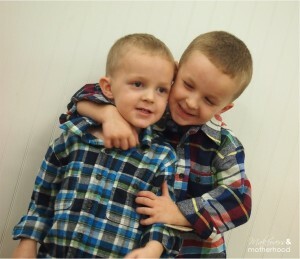 And Ethan toddled out with a pair of athletic pants, 2 long-sleeve t-shirts, and a plaid flannel shirt. We ended up closing down the store that night. And as we left, the boys walked out on top of the world having just been spoiled with such a nice shopping spree! 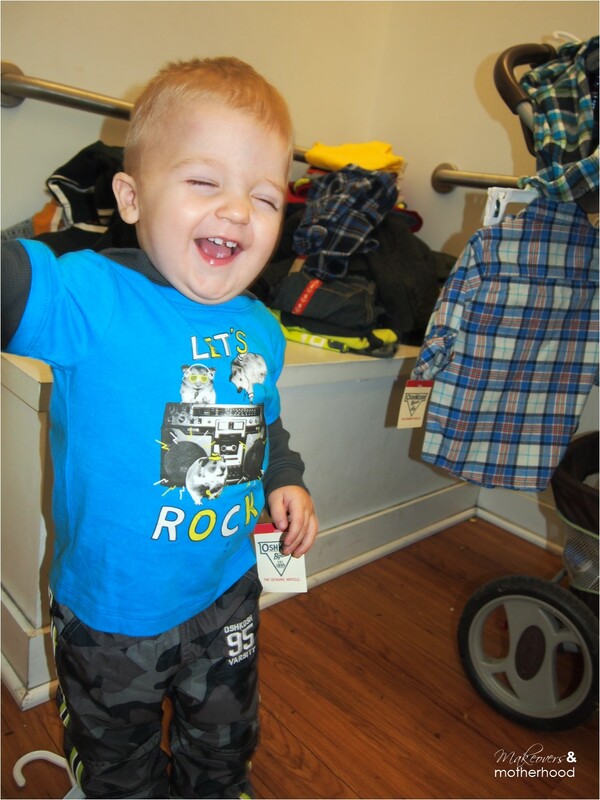 And as for me… I was impressed to find everything I needed for boys clothing in one store… quality, affordability, and style! 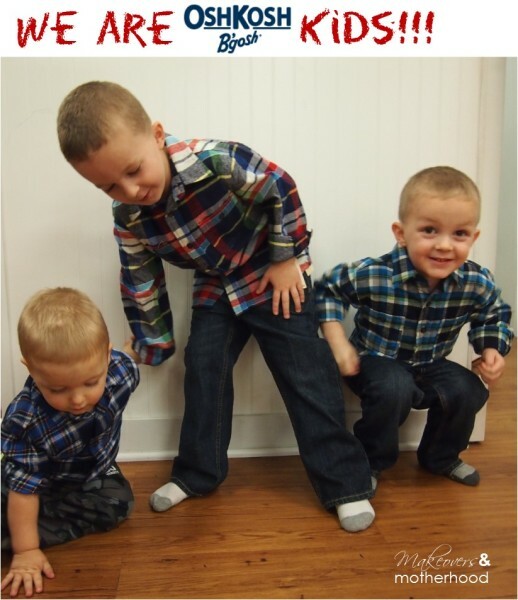 To learn more about OshKosh B’gosh clothing and see the lastest in kid fashion, visit http://www.oshkosh.com/. 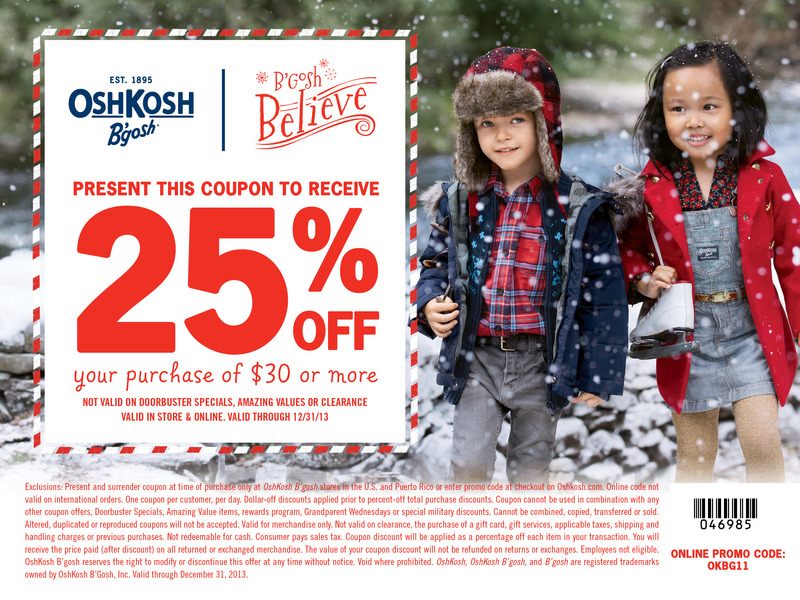 And… don’t forget your 25% off OshKosh B’gosh coupon! Happy shopping!